Spatially resolved spectroscopic process analysis in microreactors using pushbroom-imaging and fiber optics. 12-Jun-2018: Global competition in the chemical industry, with increasingly dynamic markets and product cycles, requires shorter process development times and flexible and efficient production processes. By combining micro chemical engineering and spectroscopic process analysis in different spectral ranges, the time-to-market can be shortened, and an extremely fast and systematic screening of a variety of process conditions can be achieved. Due to the compact equipment size, processes can be monitored spectroscopically with a high temporal and spatial resolution. The statistical design of experiments, and chemometric evaluation methods that help to obtain quantitative information on the product composition, enable the quick and reliable identification of safe and economical process conditions. The increasing demand for flexible production processes requires both configurable modular process technologies and also innovations in process control and automation. Instead of fixed models and rigid operations, shifting production campaigns demand process control based solely on knowledge and data - ideally in real-time. Individual sensors integrated into the process chain do not provide sufficient information. Instead, innovative inline or online analytical methods, especially rapid spectroscopic measurement methods, are needed. Individually or in combination, these methods generate information on product composition and are actively integrated into process management and control. This also contributes to process safety, because critical process conditions are identified and corrected at an early stage. 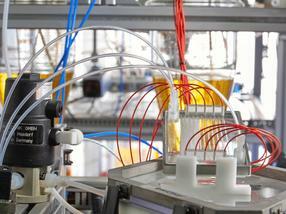 At the Fraunhofer Institute for Chemical Technology ICT, process analytical measuring systems are developed based on spectroscopic analysis techniques, and adapted to chemical processes. They help to generate the necessary information about diagnostics, optimization, surveillance and active process control. Vibrational spectroscopy (Raman, mid-infrared and near-infrared spectroscopy) and absorption spectroscopy (UV/Vis) are used. At the ACHEMA, the leading show for the process industries, Fraunhofer ICT will present a selection of its developments in process spectroscopy at the joint booth of the Fraunhofer-Gesellschaft. These include state-of-the-art imaging methods which collect spectral data (UV/Vis) within a defined reactor section, novel quantum cascade lasers which make measurements more sensitive than ever before in the MIR range, and MIR process spectrometers enabling multiplex spectroscopy at numerous points in the process through the use of optical fibers.